Explore the work of Vivian Maier and identify five street photographs that show the influence of surrealism. Write a short reflective commentary. Like the work of Atget, shopfronts feature frequently in Maier’s photographs. This image shows an eye for capturing an unusual moment, the shoes standing out of place next to the tins of peaches in the shop window. There is an element of humour as attempts to unravel the narrative are made – what is the man in the picture trying to do? Is this a futile attempt to hide from someone? This photograph is a demonstration of the development of surrealism as a term which describes something unusual and unexpected. 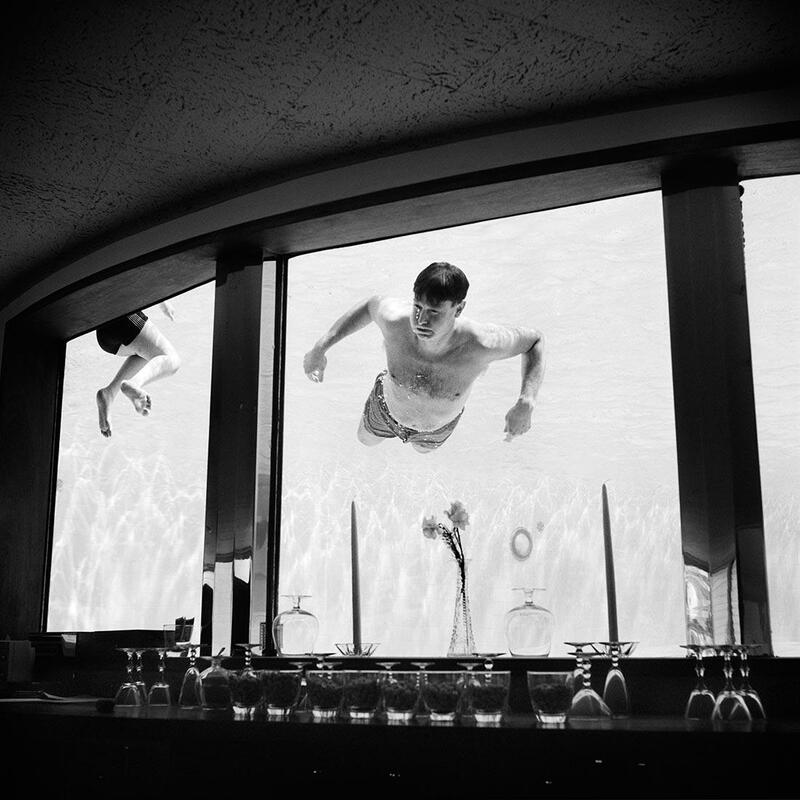 The bar with a swimming pool feature is both strange and pointless. For me, the image is made by the expression on the man’s face as he looks into the bar area suggesting what he is viewing is of more interest than the bizarre scene we are presented with. A fleeting candid moment captured, showing Maier’s keen observational eye. The mirroring of the spectator with the figure in the painting is amusing while suggesting the man is behaving this way subconsciously – behaviour that is a key concern of surrealism. Here the cold weather clothing of the man using a reflective card to aid sunbathing is amusing and bizarre. 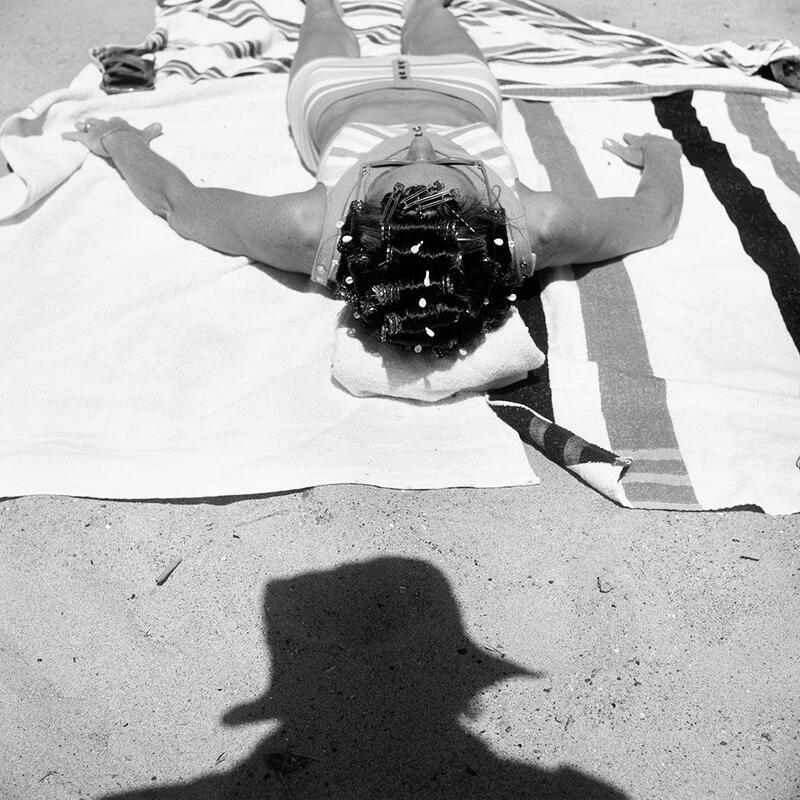 The inclusion of the shadow of Maier’s head as she takes the photograph is a recurring motif in her work. Maier took many self-portraits, in most she is almost the indirect subject however. 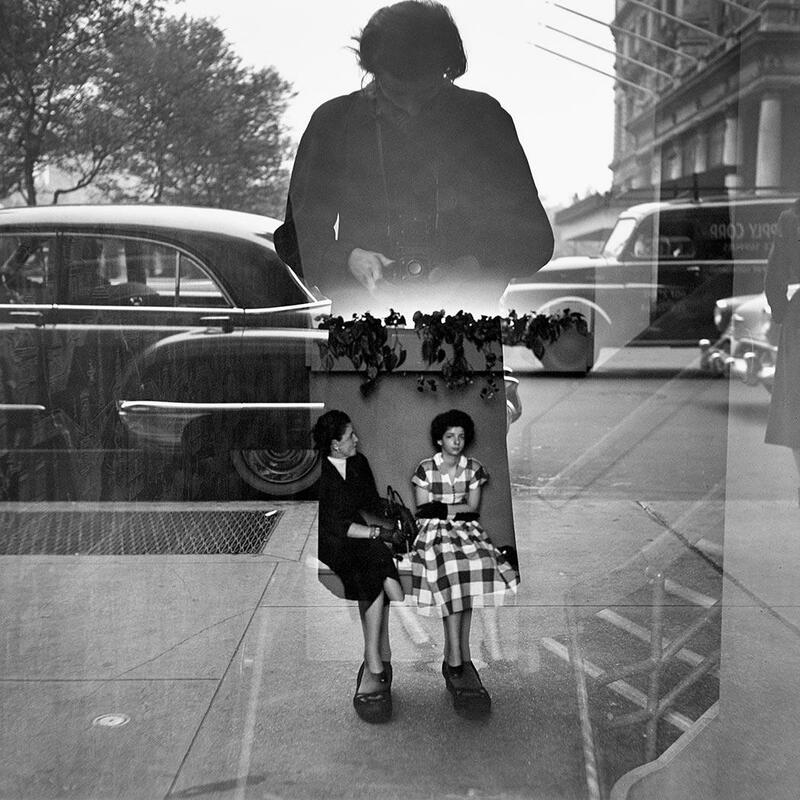 This photograph uses the Surrealist motif of reflections while commenting in the photographic process itself – the women sitting behind the glass are only revealed in the photograph because of the shadow cast by Maier. Again, Maier is not the direct subject in this self-portrait. The juxtaposition between herself seemingly wearing a hat and coat while the woman she photographs sunbathes in a bikini suggests the idiosyncratic nature of the photographer. Do some independent research into contemporary street photography. I like the way this quote defines the ethos of what makes a street photograph while being unspecific about the process – the point being that it is impossible to pigeon hole street photography as a genre. That street photographs are typified by the desire to capture the real world as it is, showing a reliance on the indexical and (seemingly) objective nature of the photograph is significant, especially considering that a common motif is the subversion of reality through the capture of the bizarre, unusual and fleeting. Howarth and McLaren continue with examples of street photographers who produce work that is often wildly different in style, content and approach, and yet, remain linked as street photographers. 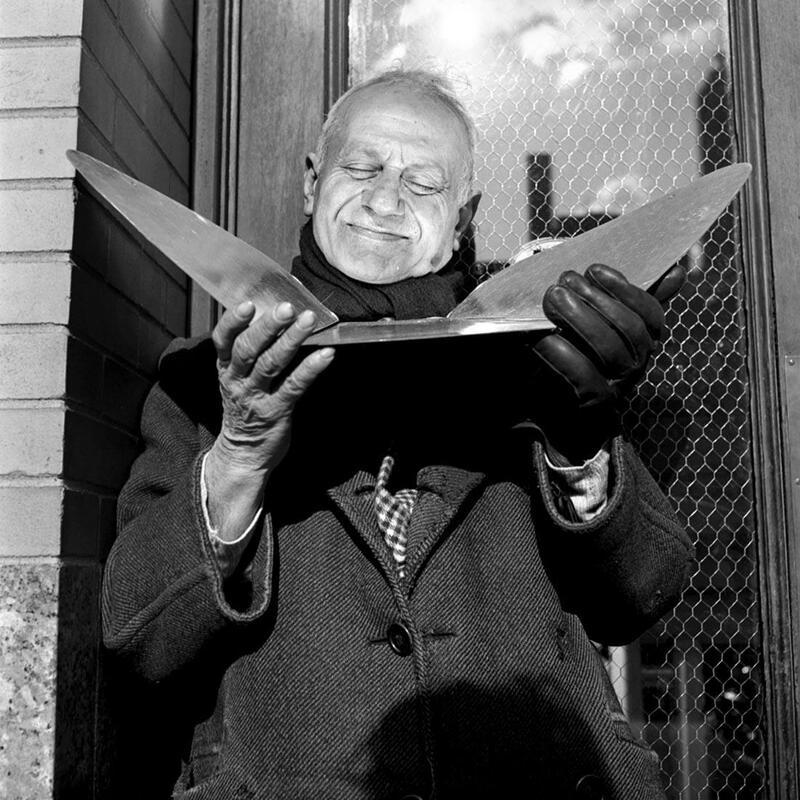 For example, the technical virtuosity and compelling content that typifies the work of photographers such as Henri Cartier-Bresson and Robert Doisneau is contrasted with the work of Robert Frank who apparently found gold in the most uninspiring subjects. What does link these opposing styles however is the relationship between chance, patience, persistence and the ability to edit – a strength of each of them. The approach of photographers is also considered. 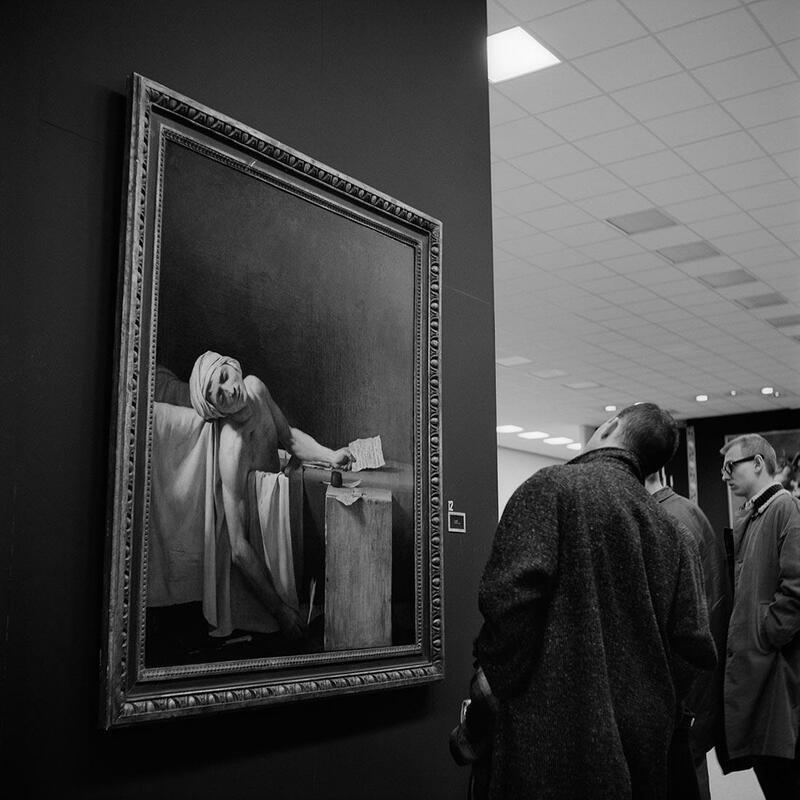 For example, Cartier-Bresson could be seen as the stereotypical street photographer, working with stealth, dodging in and out of crowds without direct involvement using pure methods of no flash or cropping. (He described his working approach as: “A velvet hand, a hawk’s eye; these are all one needs.” Howarth and McLaren, 2011: 12) contrast this with William Klein who thrived on confrontation and was unconcerned with offending people and Bruce Gilden who uses flash to give the subjects of his images his trademark startled style. Seemingly these photographers are a million miles away from Cartier-Bresson, and yet, they are all linked as street photographers. The Leica is the stereotypical tool of the street photographer as it enabled photographers to take images quickly, quietly and discretely. Some street photographers however prefer to work with medium or large format – tools that require a slow and methodical approach that seems at odds with street photography. For example, Brassaï used glass plates which required ling exposures and a tripod because he wanted to create pictures through cooperation rather than capturing people unaware. The essay ends on a positive note detailing the way street photography is currently experiencing a resurgence due to changing technology with the internet allowing images to be quickly and easily shared from around the world and digital photography revolutionising the accessibility of photography as a mode of expression. Personally, street photography for me is the essence of photography, I find the diverse work of practitioners inspiring and heading out into the street to take images without preconceptions is one of my preferred ways of working. One of the most interesting developments that advances in technology has enabled is the blurring between the amateur and professional, that is those who photograph as a career and those who photograph as a means of expression. I wonder if Vivian Maier would have embraced this as a way to show her images or whether she would have kept them private for herself, how much satisfaction does the artist receive from validation and how much is driven through personal goals? This is something at the forefront of my mind as I consider how I want my own practice to develop and be sustained. Howarth, S. and McLaren S. (2011) Street Photography Now. London: Thames & Hudson.